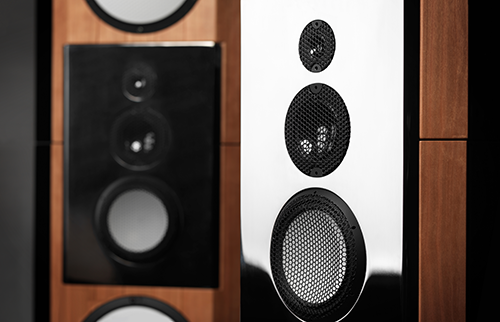 The Coltrane series represents a milestone not only for Marten, but for speaker design in general. The speakers in the Coltrane series are the first to use this combination of ceramic and diamond drivers, with tweeters in pure diamond. Marten’s flagship series uses exclusive materials throughout. Carbon fibre cabinets. Beautifully crafted solid wood work made by Sweden’s finest craftsmen. Ceramic and diamond drivers, with tweeters in pure diamond. Marten Coltrane Series speakers are the first to use this combination. The result? Extreme clarity, speed and resolution, and uncannily musical even at low volume. The Coltrane Series is the ultimate reference in sound reproduction. The Coltrane Supreme 2 sound quality so genuine that distinguishing between the recording and the performance is not possible. With eyes closed, the playback of the recording is identical to the live performance. The live feeling of the music, played by the musicians at the point of the recording, is reproduced in every detail. The Coltrane Momento is very close to the Coltrane Supreme In performance. The sound of this loudspeaker system is breathtaking, with extreme detail, clarity, speed, dynamics, and resolution combined with a deep, wide soundstage and extremely good bass performance. The Coltrane 2’s newly developed carbon fibre laminate cabinet reduces resonances to close to zero. The result is remarkable resolution and transparency coupled with amazing power. the original Coltrane despite being 40% larger. 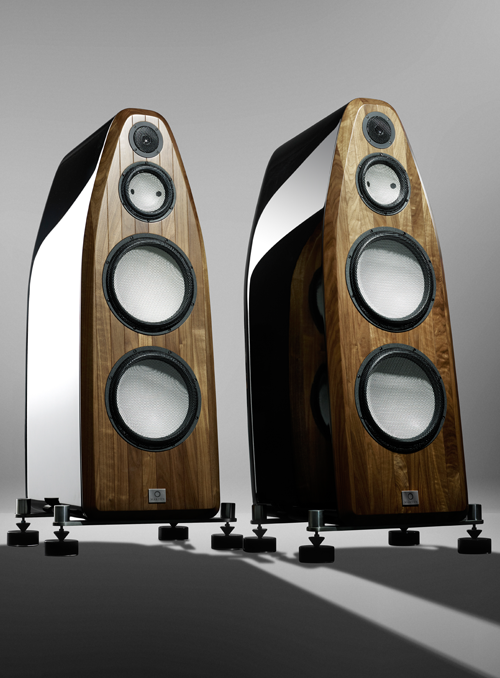 Distinguished and refined, the Coltrane Tenor is the latest speaker in the renowned Coltrane Series. The Tenor is significantly more powerful than previous models, yet it still delivers extreme clarity, speed and resolution. Marten’s goal was simple: Design the best speaker in the world. The Coltrane Supreme 2 achieves that goal. To create the ultimate speaker, Marten first set an absolute reference point—a self-made recording called the “Supreme Sessions.” The result? With eyes closed, the playback of the recording is identical to the live performance. The live feeling of the music, played by the musicians at the point of the recording, is reproduced in every detail. The Coltrane Supreme 2 has a sound quality so genuine that distinguishing between recorded music and reality is simply not possible. High Fidelity in its essence. Marten cut no corners and made no compromises. Every single element is the best, period. The sides are made of 27mm thick carbon fibre laminate, layered with 45mm 5-layered wood. The carbon fibre laminate is two layers of carbon sandwiched together with honeycomb Kevlar in between. The lever principle with these two layers, and the slight curve of the sides, makes these materials stronger yet, lending a ‘non-stretching’ effect. And making it one of the strongest materials in the world. The wooden fronts and backs are made of four 70mm thick layers of solid wood and wood materials, sandwiched together with deadening glue. The lever principle applies here, too, making them exceptionally rigid. The feet are of Marten’s own production and design, made of high quality stainless steel. BDR pucks and cones, made of solid carbon fibre, dampen any resonance remarkably effectively. The binding posts and terminals are ‘WBT Next Gen’ and are made of minimized metal, providing extremely good signal properties. The internal wiring is the new Jorma Design Statement. These are custom-made with a specially designed steel shielding giving zero distortion between the cables. In total, we use 60 metres of this exceptional wiring. The crossover is an entirely new approach. This technique, based on the joint venture with Accuton and their CELL technology, creates a sound which is 100% time and phase coherent. This means that all the frequencies are rendered and outputted at the exact same moment. Very few loudspeakers are capable of this. The units all employ the newly developed CELL Concept Drivers. 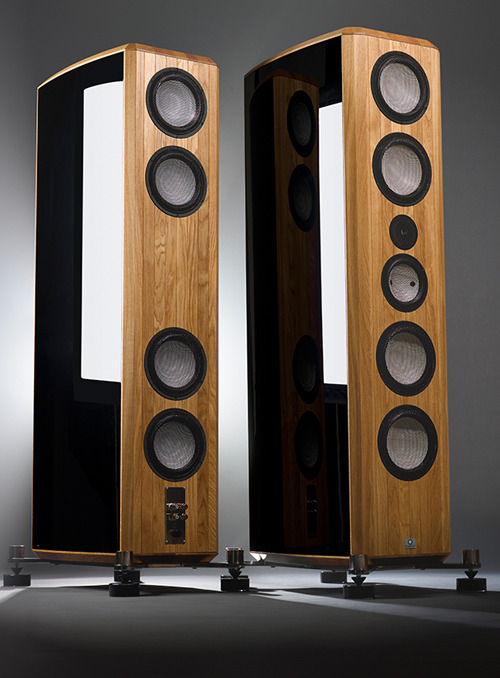 Marten Coltrane Momento speakers are very close to the Coltrane Supreme 2 in performance. This loudspeaker system sounds breathtaking, with extreme detail, clarity, speed, dynamics, and resolution combined with a deep, wide soundstage and extremely good bass performance. The Momento employs four 9" ceramic woofers, four 9" passive radiators, and one 7" ceramic midrange driver, all from Accuton, plus a 1" diamond tweeter from Jantzen Audio. The body of the cabinet is made of 20mm carbon fibre, while the front, back, top, and bottom are made of 30mm solid wood.The stands are made of polished stainless steel with carbon fibre pucks and cones by Black Diamond Racing. The new passive radiators contribute to the system’s even, highly-controlled bass and create a realistic, full-bodied performance. 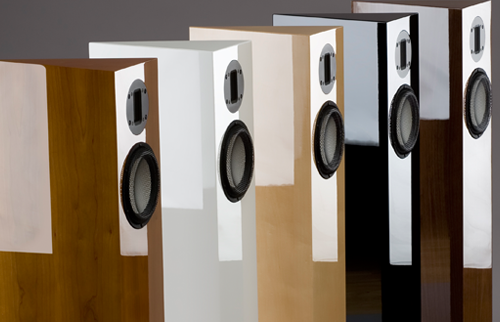 The Marten Coltrane Momento is a true reference loudspeaker. The bass level is adjustable in three steps (0, -1, and -2 dB between 50 and 120 Hz). The custom-made 26mm diamond tweeter comes from Jantzen Audio. Diamond is one of the most rigid materials known to man.There is virtually no resonance, and diamond tweeters produce a pure, uncoloured, distortion-free sound. 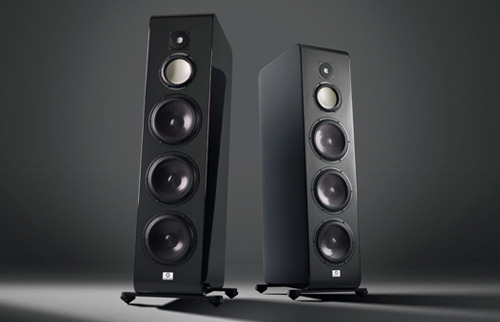 The midrange drivers have resonance damping and laser-drilled holes in the ceramic cones. This simplifies the crossover and provides even lower distortion in the crucial midrange area. The refined, extremely high-quality crossovers feature components that include silver- and copper-foil coils and pure copper- and silver-in-oil capacitors from Jensen. The internal wiring is custom-made by Jorma Design and consists of their top-of-the-line Prime cable. The body of the cabinet is made of 20mm carbon fibre laminate, with 30mm solid wood front, back, top, and bottom. There is virtually no resonance in this cabinet. The stands are polished stainless steel stands with Black Diamond Racing pucks and cones. Remarkable resolution and transparency coupled with amazing power. 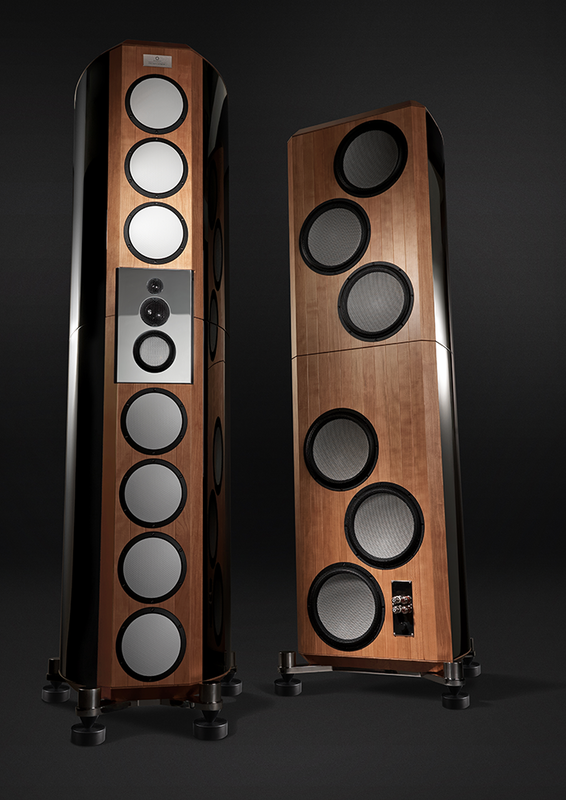 The Coltrane 2’s newly developed carbon fibre laminate cabinet reduces resonances to close to zero. As versatile as the original Coltrane despite being 40 percent larger, the Coltrane 2 is extremely powerful while delivering even better resolution and transparency. Along with the cabinet, the individual components of the Coltrane 2 have also been specifically designed. The speaker employs two newly developed 11-inch ceramic sandwich woofers, a ceramic midrange driver, and a diamond tweeter, all created in partnership with Accuton. With these new bass drivers, the Coltrane 2 delivers extreme dynamics and a big, relaxed sound. With three levels of bass adjustment, the Coltrane 2 can be easily integrated into any listening room. The Coltrane 2 is very powerful, yet is a very easy load for amplifiers, never going below 4.1 Ohms impedance. Distinguished and refined, the Coltrane Tenor is the latest speaker in the renowned Coltrane series. Significantly more powerful than previous models, it still delivers the extreme clarity, speed and resolution that have made the Coltrane series’ name.